Much as popular athletes and movie stars are often forgiven for bad behavior, superstar salespeople often seem immune to the professional standards to which the rest of us are held accountable. Is this the right way to manage our revenue stream? Does it optimize the customer’s experience? Learn from your Best-in-Class peers and competitors how to maintain a healthy balance between enabling performance and demanding respect. Has this phrase ever been uttered in your enterprise? One of the unique and most straightforward elements of managing B2B salespeople, compared with other job roles, is the simple fact that their performance is so easy to gauge. For the most part, sales reps either make their quota or don’t, with a direct impact on both their income and job security. Managing them, therefore, should be a black-and-white value proposition, right? As long as reps sell or manage enough revenue, doesn’t that single metric allow us to make clear-cut decisions regarding their status? In reality, the answers are more complex. Contemporary leaders of sales organizations have come to understand that while quota attainment is far and away the most important barometer of individual sales success, it is not the sole contribution that matters to the overall value of a rep accrued by their employer. For example, what if the cost-of-sale for a million-dollar seller was calculated at $900,000, while another rep sold $800,000 worth of products, but only cost $600,000 to reach that number? A savvy sales operations practitioner would use this data to recommend that a lower-gross performer, offering twice the margin, was more valuable than their high-flying, President’s Club-achieving counterpart. If we bring back the metaphor of a misbehaving All-Star athlete, think about the widely-known lessons of MoneyBall: just because an individual contributor makes a lot of sales, it does not mean he or she is adding the most value to your business. Figure 1: Is a Hard Decision the Right Call? In the naturally competitive sales field, top performers are generally going to receive extra visibility and attention, and some of them inevitably grow arrogant as a result. Considering that the weakest performers in sales typically lose their jobs more rapidly than other corporate job roles, the emotionally charged environment can easily lead to an unhealthy dynamic where petty jealousies and resentment toward hubris-filled “A players” can be destructive to the overall mood, and success, of the team as a whole. This is admittedly a fine line for sales leaders to walk: we want to showcase and reward strong performance, but need “to use the power for good, not evil” by motivating under-performers without destroying their confidence. Top sellers strutting around like peacocks can hurt the overall group more than they help. In addition to negatively impacting the internal sales team environment and commanding inordinate amounts of damage-control attention from leaders, a high-maintenance rep can de-credentialize the entire sales function within the enterprise. We’ve all heard the whispers and complaints from other departments about how Sales is spoiled ‒ note the famous “A Few Good Men” spoof ‒ and it does no one a favor to exacerbate that reputation where it unfortunately does exist. Furthering this concept, the second item in Figure 1 shows how Best-in-Class sales leaders out-pace All Others by 69% (54% vs. 32%) in creating a sense of balance in terms of evaluating their sellers. We learn here that, while it is reasonable to expect that the vast majority of financial remuneration provided to salespeople is based on their revenue-generation accomplishments, the strongest-performing sales leaders do not solely rely on how much product is pushed by their reps when deciding how to compensate them. Instead, they deploy the kind of balanced scorecard approach, well-documented by Aberdeen’s Human Capital Management practice, to link at least a small portion of sales compensation to… wait for it… good behavior. The lesson here: great selling and grown-up interactions are not mutually exclusive, and the organizations that actively support this approach are more successful. 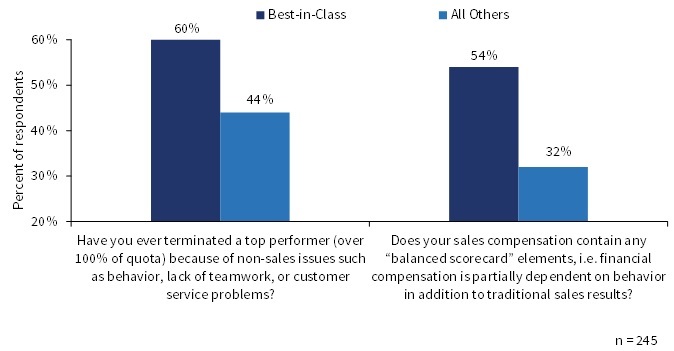 As testament to this concept, we look in Figure 2 at what the Best-in-Class indicated to Aberdeen were the most effective motivators of superior sales performance. Money is, and should be, predictably at the top of the list, and yet the percentage of top performers not selecting pay as a top-three motivator has increased twelve-fold (2% vs. 24%) since the previous year’s SPM research was published. This represents a quantum leap in the awareness of sales leaders that the other motivators ‒ tapping into peoples’ need for recognition, their sense of teamwork, and their competitive spirit ‒ are ever-more crucial in managing today’s B2B sales professionals. This article was syndicated from Business 2 Community: Would You Fire A High-Performing Sales Jerk?